What if there was a better way for you to get muscle building, strength and performance results while staying injury-free? What if there was a science that would allow you to stick with a workout consistently? 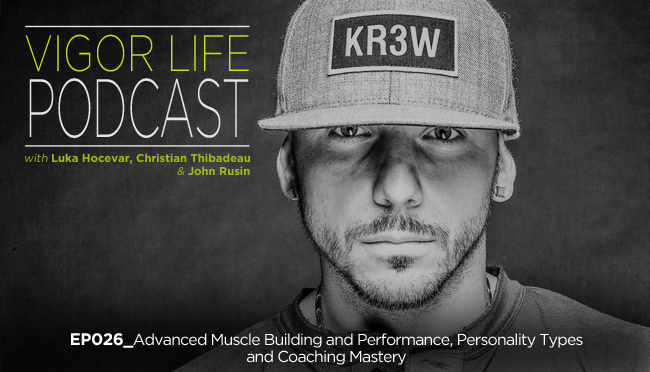 Christian Thibadeau and John Rusin, two of the world’s top strength, hypertrophy and performance coaches join me to talk about the big mistakes most people make when it comes to improving their physique, strength and performance – while staying pain-free. Also, they share insight about training people with different personality types, and how those personal characteristics affect training, nutrition, recovery and compliance. This is some extremely insightful information that you most likely haven’t heard yet! To cap it off, we dive deep into what it takes to be a great coach and some of the biggest traits that are currently lacking in the fitness industry. This entry was posted in Podcasts and tagged Athletic Training, Body Composition, Body Transformatiom, Business, Conditioning, Fitness, Fitness Business, Performance, Personal Development, Podcast, Self Development, Training, Transformation, VigorLife. Bookmark the permalink.